Home » Out! Series » Black Out! Did you know that the luna moth only flutters around at night–or that is has a wingspan as wide as a bowl of soup? This reader is packed with interesting facts about all the creepy animals that we never get to see during the daytime, like the barn owl, the blind cave fish, and the vampire squid. Thanks, Olivia! 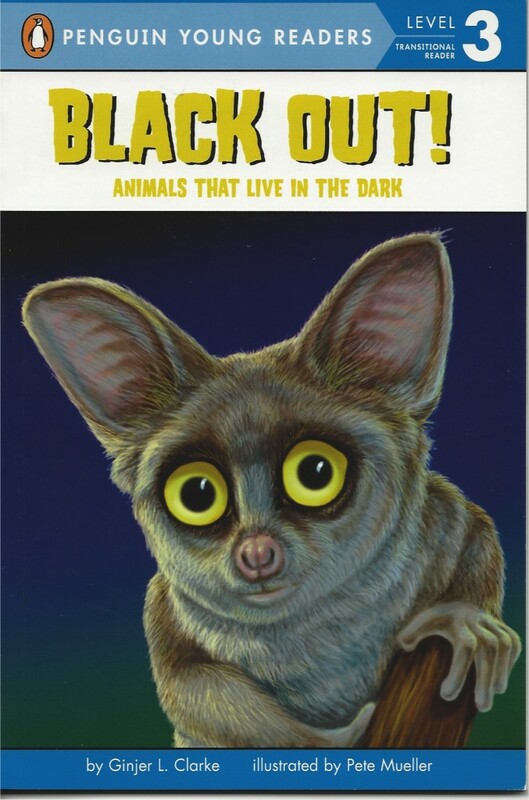 I’m glad you enjoyed reading about animals that live in the dark. I got this CUTE book for my mom for Christmas. I really enjoyed this book . Hi, Nim. I’m so glad that you enjoyed my books! I can tell you’re a real animal lover and a great reader. Keep it up, and you’ll have another new book to read soon: Pouch Babies will be out on April 28 (and then Watch Out! on August 4). Happy reading! I love writing books, but I don’t have enough time to do the research like you said. You came to my school today (March 24th) and said that if you want to write a non-fiction book that you need to research. How can I use time that I have to research? Hi, Kelly. I’m so glad you enjoy writing and are interested in nonfiction. You don’t have to do as much research as I do just to write a story. Try finding a couple of books on your favorite topic at your school or local library and just get as much information as you can from those. Internet research is pretty quick too, but make sure you use good science sites, not something that just a person wrote or an unconfirmed site like Wikipedia. Have fun with it, and happy writing! It’s me again. I love your books, and I wanted to write one on baby lions and tigers. I searched everywhere to find your books but I can’t find them. I even looked in librarys. Where can I find them for a cheap price? I get an allowence and I was saving up to buy one. Hi, Mai! I’m so glad that you enjoy my books. Happy Reading! Enjoy learning about the playful, adorable river otters. Hi, Kelly. I’m so glad that you enjoy my books. Some school and neighborhood libraries do have my books, but I’m sorry you weren’t able to find them. My books are only $4 each, but you can find some cheaper used copies on Amazon.com (but you do have to pay for shipping). It is probably cheapest to ask your local bookstore to order my books for you and then pick them up there. Good luck, and happy reading! Hi, Lasya. Thanks for writing. Watch Out! will be published in August, so it should be in your school’s bookfair this fall, or you can buy it in bookstores on online. I don’t know of any bats that are poisonous, but you could do some more research to find out. I promise there are lots of friendly animals in my Baby series books (Baby Otter, Baby Meerkats, Baby Elephant). I enjoyed visiting your school too. Happy reading! Thanks Ginjer! My friend Mai Phoung aslo left a coment, I am so happy that you respond to your coments. Thanks for your help!